Admired for his fusion of German and Italianate musical elements, Johann Simon Mayr is increasingly recognised as one of the most intriguing and influential composers of his time. 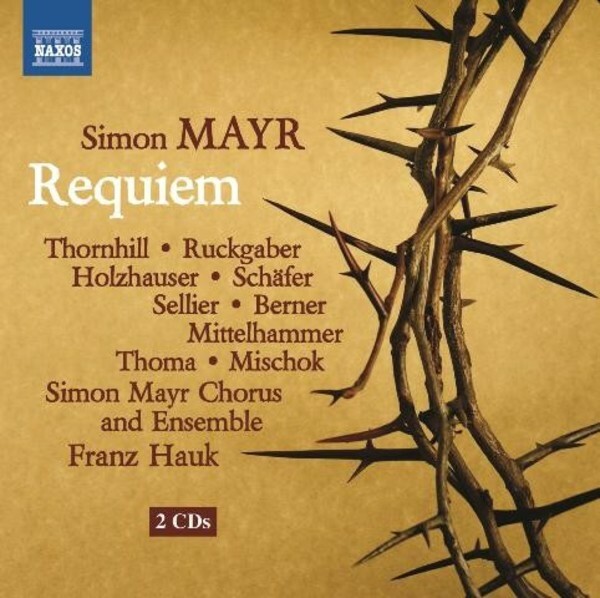 His Requiem in G minor is shrouded in compositional obscurity but it is clear that the published version is surpassed both in scale and instrumentation by the elaborate edition performed here, which has been assembled from the autograph manuscripts. Small sections were composed by Donizetti and then corrected by his teacher, Mayr. Church style and more Romanticised elements are finely balanced in this important example of Mayr�s compositional language. Born in Neuburg an der Donau in 1955, Franz Hauk studied church and school music, with piano and organ, at the Munich Musikhochschule and in Salzburg. In 1988 he took his doctorate with a thesis on church music in Munich at the beginning of the nineteenth century. He has given concerts in Europe and the United States and made a number of recordings. Since October 2002 he has taught in the historical performance and church music department of the Munich Music and Theatre Hochschule, while winning a reputation for his research and the performances he has directed. He founded the Simon Mayr Choir in 2003, and in 2013 was awarded the German Order of Merit.